We’d love your help. Let us know what’s wrong with this preview of Shifting Horizons by S.J. Sherwood. Pod Fifteen has escaped Ilse's cruel regime only to fall intothe hands of a strange Nomadic Tribe. Their charismatic leader, Omar, begins to fill Ned's mind with ideas about his destiny. A possible future that puts the Pod's hard-fought frie In a future divided into Secular and Non-Secular Quadrants, a crime punishable by death is to cross Quandrants and become a Dedounced. To ask other readers questions about Shifting Horizons, please sign up. After finishing the first book, I couldn't wait to see what happened next. When I found out about this one, dropped everything to begin reading it, so that I could post the review today, so soon after my unboxing video. And I'm glad I did. With a really nice orange cover, this blended seamlessly with the other cover. As I was reading Shifting Horizons I felt that it was a potentially good idea that had been let down by poor execution. Book two sees our dystopian Breakfast Club (the athlete, the brain, the princess et al.) are still chained to their character archetypes and unfortunately see no real growth. I also would have appreciated a more considered hand at editing, because the text is littered with errors and bad grammatical choices that are very distracting for me personally as a reader. Ned, the stoic As I was reading Shifting Horizons I felt that it was a potentially good idea that had been let down by poor execution. Book two sees our dystopian Breakfast Club (the athlete, the brain, the princess et al.) are still chained to their character archetypes and unfortunately see no real growth. I also would have appreciated a more considered hand at editing, because the text is littered with errors and bad grammatical choices that are very distracting for me personally as a reader. Ned, the stoic tactician with 'gravitas' has a distractingly clunky inner dialogue, delivering such lines as 'Their hands will be tied, I'm sure of that, but I won't know until I know, so I decide there is nothing I can do but save my mental strength for the time that is surely coming soon' with complete solemnity. A lot of persistent new writer pitfalls can be avoided with another manuscript pass through. Shifting Horizons is the second in S.J. Sherwood's Denounced series and it starts immediately where A Grey Sun finished. I was a little confused with the first few paragraphs until I realised that Ned, the main character, was confused. It was such a well written bit of disorientation that it worked on me as a reader. There's depth, conflict and a series of obstacles in Shifting Horizons. The title shows how Ned and Pod 15's view of the world changes over the course of the story. At the end of A Shifting Horizons is the second in S.J. 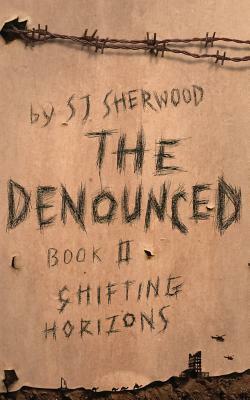 Sherwood's Denounced series and it starts immediately where A Grey Sun finished. I was a little confused with the first few paragraphs until I realised that Ned, the main character, was confused. It was such a well written bit of disorientation that it worked on me as a reader. There's depth, conflict and a series of obstacles in Shifting Horizons. The title shows how Ned and Pod 15's view of the world changes over the course of the story. At the end of A Grey Sun they'd broken out of the training dome that they'd been sent to as Denounced, condemned to die. In Shifting Horizons they find they are on the edge of the Sahara desert, and try to evade the hunters attempting to recapture them. Pod 15 aren't united, there's a conflict between Ned and a couple of others who believe that they've passed the test Ilse set for them and that it is safe to go back. A mad dash through a flooded cavern system in the mountains helps them initially, then they break out into the desert as the only way to get away from their pursuit. The conflict is cut short by a sandstorm, after which they're rescued by a nomadic tribe lead by the enigmatic Omar. There's a whole philosophic exploration here, but done gently and subtly. Ned is helped to think on broader horizons than he'd had before. He's also pointed along a path that could mean freedom, not just for him but also for other Denounced. It's not a safe path, and he has choices. Conversations with Omar, the other members of Pod 15, and Ned's inner dialogue brought depth to his character, and to the others too. We can see Ned's inner conflict, the temptations and frustrations. There's external conflict too. Omar isn't necessarily as benevolent as he first appears, and he's playing both sides in a subtle political game to suit his own agenda and protect his tribe. That's mirrored in the internal tensions within the six members of Pod 15. Ned finds two opposed to him, one neutral and two supportive. At all turns there's effort to cut Ned adrift from the rest of the Pod and cast them aside. He struggles to keep them with him, even when it doesn't seem in his best interest. The bonding in the training dome and then their shared escape has bound Ned to the Pod, even if it hasn't necessarily bound them all to Ned. This second volume leads on from where the first one, Grey Sun, set the scene. Hero Ned and his cohorts at the mysterious prison/military training camp, have escaped the matrix-like enclosure where they were being held, to the outside world for the first time. Their captors however, are in hot pursuit and they barely escape with their lives. Now, they have to negotiate a totally new and unfamiliar desert world, of nomads with totally alien customs - and wildlife. Not much detail is gone into in This second volume leads on from where the first one, Grey Sun, set the scene. Hero Ned and his cohorts at the mysterious prison/military training camp, have escaped the matrix-like enclosure where they were being held, to the outside world for the first time. Their captors however, are in hot pursuit and they barely escape with their lives. Now, they have to negotiate a totally new and unfamiliar desert world, of nomads with totally alien customs - and wildlife. Not much detail is gone into in how the world came to be divided into so-called quadrants, no longer defined as countries or continents, but Ned's pod have to refamiliarise thememselves with things previously only seen in picture books: camels and scorpions. The desert people seem to follow a faith as well as a moral code, where faiths had been banned on pain of death within the so-called secular quadrants. All of the children - and legally, all of the the pod members had been minors - had been 'denounced' as traitors to their quadrants and condemned to death. 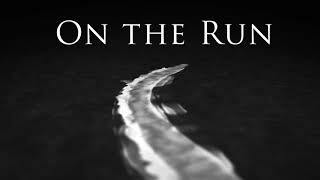 The sense of guilt does not exactly create much solidarity between the team members and the tensions and lack of faith only escalate between the team members in this edition of the trilogy. Ned already has good reason, however, to suspect that he truly is innocent, that certain factions might have had vested interests in having him selected for the training camp. In fact, most of them had probably been set up, as unwilling recruits for some new power struggle. In this new community Ned meets an older man, Omar, who appears to wish to mentor him - to allow him to integrate into the ways of the desert people and be a new son to hom. Ned, however, questions the motives of everyone with the hypervigilence of an orphan who has been let down too many times. He is not entirely willing to surrender his guard, as Omar chides him for being principally a prisoner of his own mind. But when one of his pod unknowingly violates the mores of the desert people, Ned and his pod find themselves on the run again, with a new missive to reach a new destination. I'm SJ Sherwood and I write young adult novels with a dystopian twist. I grew up in a small town in rural England and spent most of my youth dreaming of escaping to the bright lights of a big city. I live in London where I write and enjoy life. I love podcasts, choc-chip muffins and the smell of sizzling bacon.